Biographical Information: Frank was born on 05 July 1918 to Charles and Annie Adams, of Gillingham, Kent. As a child, Frank attended the Arden Street Council School, where he was an accomplished musician. He was also a successful athlete, and excelled in football and track. 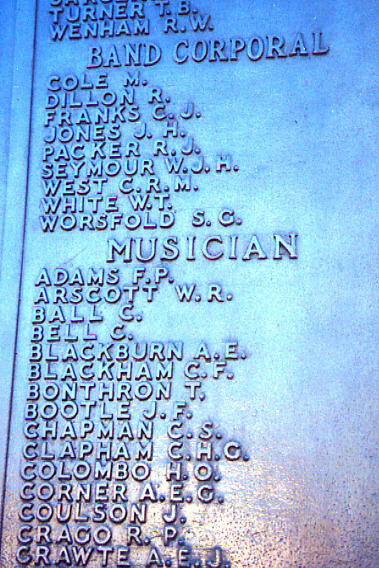 After leaving school in 1934, he joined the Royal Marine School of Music, Deal, Kent, as a Band Boy. Frank also played football on the schools team. He departed school to join his only ship, Hood. Frank's action station at the time of the sinking was the 15" Transmitting Station. He was 22 years old at the time of his loss. We have no additional information. Above- Photos of Frank in and out of uniform.